AIR NEW APPLICATIONS 42 October/November 2018 unmanned systems inside train," Chung said. "Furthermore, the most effective performers—for example, peregrine falcons—are endangered species." Prior work tried using remotely controlled (RC) airplanes that resemble birds of prey to prevent bird strikes. However, RC airplane pi- lots might find it difficult "to learn and adapt to evolving f locking behaviors of a large num- ber of birds," Chung said. Instead, Chung and his colleagues explored using unmanned aircraft systems (UAS) to di- rect birds in an automated manner. 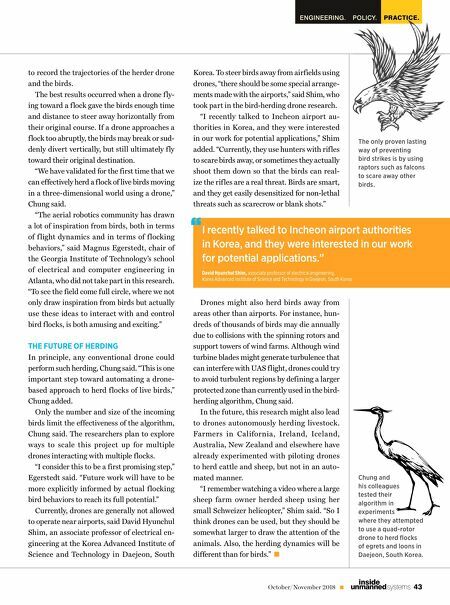 "I wanted to develop an autonomously operating drone that could figure out the best paths around a f lock of birds to effectively herd the f lock to a desired direction—for example, away from an airport," Chung said. FLOCKING ALGORITHMS The scientists began with algorithms known to accurately model how birds f ly in f locks. The researchers next incorporated research that modeled how f locks of starlings and schools of fish evade one or more predators. They de- veloped an algorithm through which a single UAS might safely divert an entire f lock of birds away from a designated space without break- ing their formation. Each bird in a f lock reacts to changes in the behavior of its closest neighbors. 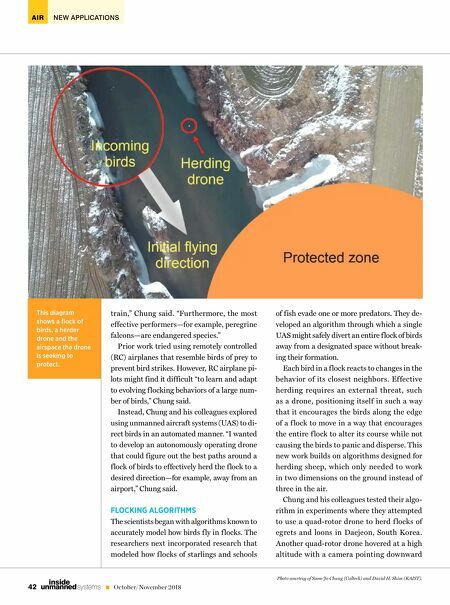 Effective herding requires an external threat, such as a drone, positioning itself in such a way that it encourages the birds along the edge of a f lock to move in a way that encourages the entire f lock to alter its course while not causing the birds to panic and disperse. This new work builds on algorithms designed for herding sheep, which only needed to work in two dimensions on the ground instead of three in the air. Chung and his colleagues tested their algo- rithm in experiments where they attempted to use a quad-rotor drone to herd f locks of egrets and loons in Daejeon, South Korea. Another quad-rotor drone hovered at a high altitude with a camera pointing downward This diagram shows a fl ock of birds, a herder drone and the airspace the drone is seeking to protect. Photo courtesy of Soon-Jo Chung (Caltech) and David H. Shim (KAIST).